Inspiration: Actor Mumbi Kaigwa (and partly a review) | Sweet Fresh Love! I enjoyed the performances and had many moments of chuckling, wanting to laugh out loud, smiling with the woman I sat next to who I met as we waited for the show to begin. Her with the long, smart, shiny dreads and the calm easy energy, drinking a Tusker light… Of the two monologues, I enjoyed the second more, probably because that character was deeper, more complex. She asked questions that few voice, like questioning if her husband the Vicar actually believes in God! Whoever asks questions like this? Isn’t it always assumed? I liked how it reveals where redemption can come from – in the woman’s case, from an extramarital relationship with a young Indian shopkeeper. The first monologue was interesting mostly because it had Mumbi taking on this character who is so completely not-her – a rather silly, kinda naive-ish, frivolous woman who’s not very smart really – and watching that stage transformation of Mumbi made it intriguing. The common link between the women and the pieces were the themes of isolation and loneliness evident in both pieces. At the end of the show, Mumbi returned to the stage (as herself of course) and welcomed the audience to ask questions. I liked this very much and it opened up into an insightful conversation. I would definitely recommend this approach for all performance pieces and possibly even visual arts exhibitions that are interested in their audience reactions and responses. Some of the things I didn’t know that came out of the conversation were the fact that for several years, Mumbi had worked in a UN-agency in a job that had nothing to do with performance and acting! And eventually, she had to get out and follow her heart – something that she feels deeply about. And out of that was born one of her own works “Voice of the Dream”. When someone asked whether one is able to make a living as an actor, she explained that it does not allow for a luxurious lifestyle and underscored that by saying something along the lines of: “something tells me that we’re not here [in life] to make money”; there really must be more to life than the amount of money we make. Agreed! 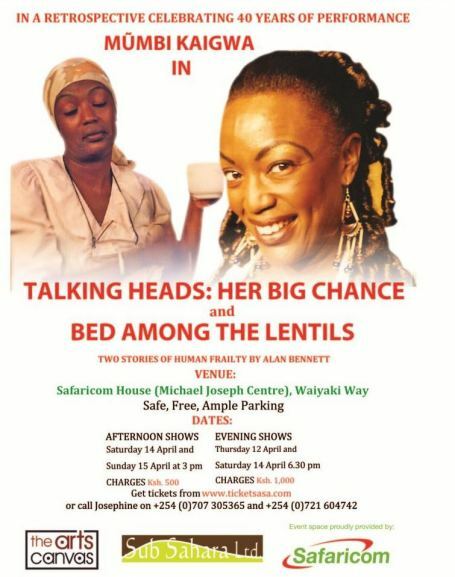 Mumbi says that she is now focusing entirely on acting, whereus in the recent past she has been doing more and more training, directing, producing, administration for her organisation The Arts Canvas etc. I do hope she does even more of what she acknowledges in the programme as her first love writing: “So after a “life” in theatre, the jury’s in: the theatre is my first love”. I am already looking forward to her next performance.